The damp and darkness of a Scottish winter have driven me indoors to pore over my 2013 diary for a fiery blast of southern sunshine. This time last year I was in the goldfields of Kalgoorlie, Western Australia where the temperature was 46 degrees; unbreathable and unsleepable and the most extreme heat I’ve ever encountered. On Hogmanay 2012 I’d caught the Prospector train from Perth for a seven hour journey east across barren land, the train track accompanied all the way by the essential water pipe from the coast that the sceptics said could never be built. And on New Year’s Day 2013 I joined my brother in the truck he drives for hundreds of miles every week, over ungraded red roads, all the way out to the remote gold mines. 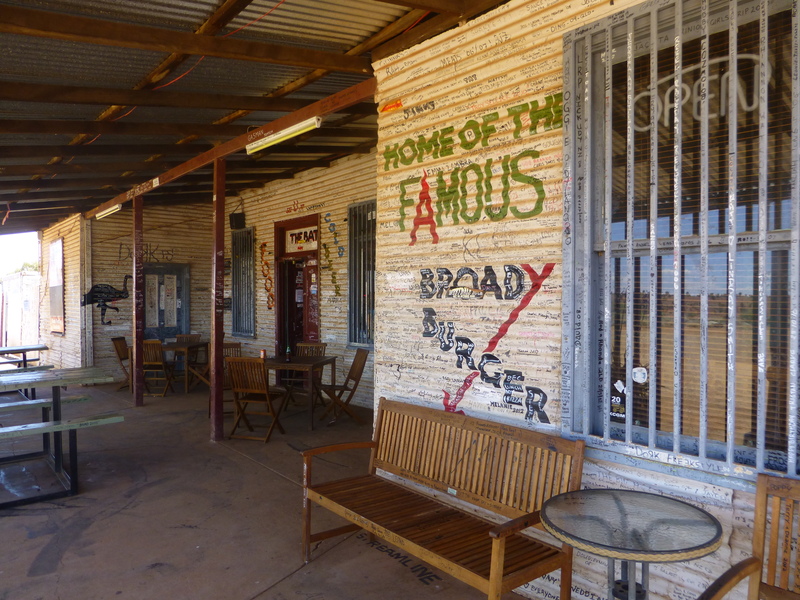 We explored deserted settlements and abandoned mines where there’s nothing but a few sun-faded signs to hint at the gamble that went into the building of pioneering prospector towns like Kanowna, just an hour’s drive from Kalgoorlie. I ventured out of the cab for a few minutes at a time to poke around the weather-beaten posts that marked ancient claims and to see how the props of solitary digs and the dreams of desperate men had crumbled to dust. The unrealised expectations that had been invested in these harsh places just 100 years ago made me wistful. The prospect of riches had attracted an optimistic community of people who build homes and hotels, formed social clubs and a football team, a fire service and a Salvation Army. Children went to school here. Yet despite enduring the discomfort and sacrifices the dream ultimately failed to deliver. And now the inhospitable land that was once home to a town full of miners and their families has been returned to nature with only a few dents in the ground to show for all the expectation and effort. 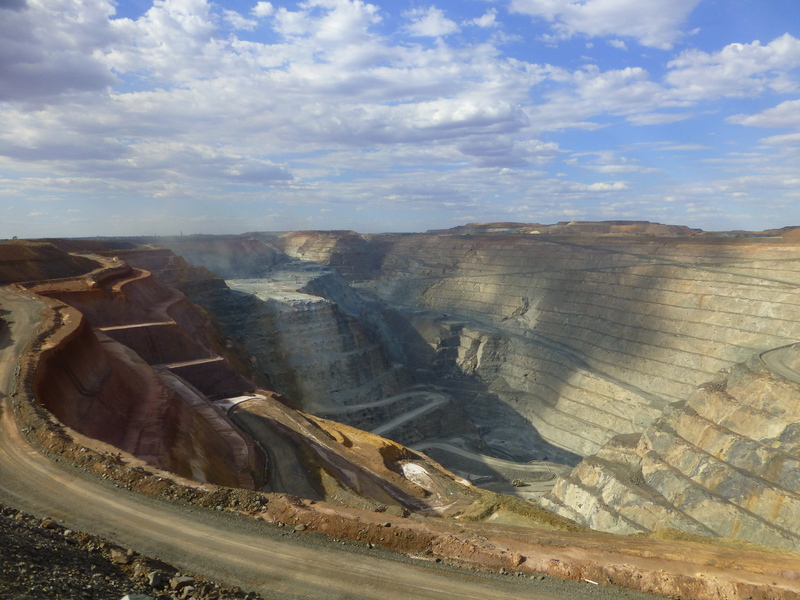 By contrast, just a few miles away, the Kalgoorlie Super Pit still continues to yield gold, ever since three Irishman stumbled across a huge nugget in 1893. Around 50 million ounces of gold have been mined here and the dumper trucks which look like worker ants in the huge scale of the pit still appear to work 24 hours a day. Kalgoorlie-Boulder was once one of the biggest cities in Australia and home to the “richest mile on earth”. 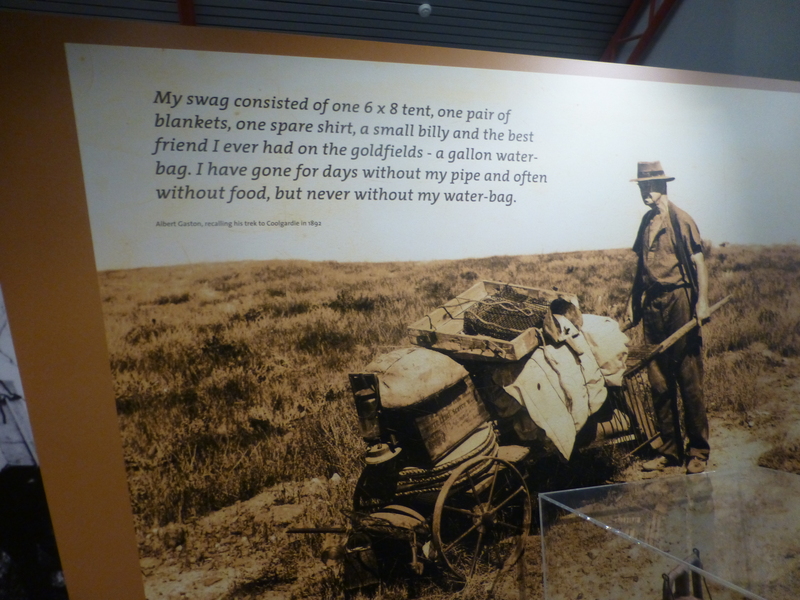 And some of the characters you meet on its streets even now look every bit as desperate and determined as the 19th century photographs of prospectors on display in the town’s museum. There were a few of these men in the Broad Arrow Tavern too, an outback pub where we retreated indoors in the relative cool and drank pint after pint of iced water and I, the unacclimatised Scot, tried to stabilise my soaring body temperature. Maybe that cool dark Scottish rain pelting the window tonight isn’t such a problem after all. I’ll just throw another log on the fire. Nice post! Well written and very interesting.